The secular works of the Lantins brothers, love songs of Lescurel, and the majesty of Dufay. I. Jehan de Lescurel: Complete Love Songs Book (Ensemble Céladon/Paulin Bündgen). Ricercar CD RIC 366. Many mysteries surround the life of Jehan de Lescurel, beginning with his date of birth. Probably the son of middle-class Parisians, cleric, musician and poet, he was most likely trained at Notre-Dame. His oeuvre consists of some thirty songs written in the waning tradition of the art of the Parisian troubadours and even broaches polyphony. In them, he describes several amorous situations, sometimes depicting the emotions of the rejected suitor, sometimes those of the beautiful misunderstood lady, in a game of love and feelings that range from nostalgia to ecstasy, and not excluding humour. In this complete recording, the three voices of Céladon are backed up by richly coloured instruments. II. 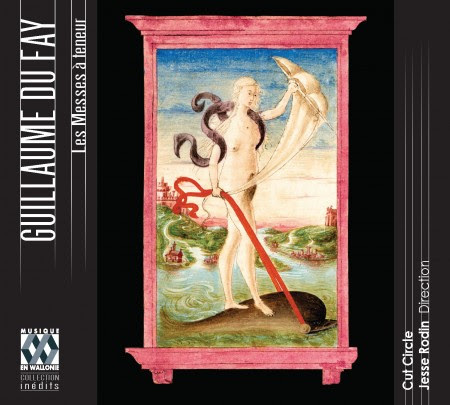 Guillaume Du Fay—Les messes à teneur (Cut Circle/Jesse Rodin). Musique en Wallonie CD MEW 1577-78. From Amazon.com: I'd say this is the best way to get to know Dufay's cantus firmus masses. It's actually a double-CD album containing four masses and a couple of additional pieces. The editions are by Rodin himself. He retains mixed key signatures, doesn't avoid cross relations too much, and slightly rewrites a passage in Missa "L'homme arme" at the phrase "in remissionem peccatorum". This rewrite is actually something I don't like; I suspect he found some sort of a source with the passage in that form, but honestly it's just not as good as the way in which it's usually done. Otherwise though, I think Rodin has done a great job as far as I can tell. The chosen tempos vary, but they never plod. Cut Circle take Missa "Se la face ay pale" exactly as fast as Chiaroscuro in every movement, which is faster than other groups, and a lot faster than Diablous in Musica. I have to say I like this fast tempo, and it's great we have two so different but great performances of this mass in these tempi. In Missa "L'homme arme", Cut Circle is faster than the Hilliards, but not as fast as Les Jeunes Solistes. Pretty much ideal to my mind. In Missa "Ecce ancilla domini", the tempo is considerably faster than that of the Ensemble Gilles Binchois, whose slow plodding tempos I'm not a fan of. I think this mass benefits from a lively, joyful tempo, even if Cut Circle doesn't quite attain the same kind of joyfulness here as Prague Madrigal Singers in their recording from the 1960s. Cut Circle's rendering is more mellow, but pleasant and pleasing and with a good pace nevertheless. Their rendering of Dufay's last mass, Missa "Ave regina caelorum" is along these lines, and the same as above could be said of it vis a vis the rendering by Prague Madrigal Singers. Not as fast or lively, but more so than Cantica Symphonia in the same mass. The balance in all these masses is usually good, but there are moments when Rodin wants to bring out a theme or voice and ends up pretty much drowning out the others or not allowing them to be properly heard even when they, to my mind, contain more interesting melodic material. These flaws are rare enough that I don't want to take off a star from what is currently a must-have Dufay album. The recorded sound is surprisingly good, possibly partly because of relatively close miking. The performances are apparently two-voices-per-part, which I believe is authentic for these masses (there are even moments in these masses when one part splits into two, so you need two singers there, suggesting two-per-part were intended by Dufay). Oh, and female singers are used as superius, which - though lacking historical justification - just sounds better as far as I'm concerned. All in all, there's no excuse for not acquiring this excellent release. III. 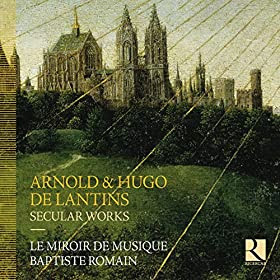 Arnold & Hugo Lantins—Secular Works (Le Miroir de Musique/Baptiste Romain). Ricercar CD RIC 365. The composers Arnold and Hugo de Lantins were natives of the diocese of Liège, but it was in Italy, principally in Pesaro and Venice that their presence is confirmed between the years of 1420 and 1430. As with the works of Johannes Ciconia, a fellow native of Liège whose time in Italy had preceded theirs, their secular and sacred compositions are preserved in manuscripts copied in Italy. Closely rubbing shoulders with their illustrious contemporary Guillaume Dufay, the Lantins brothers combined archaic traits with the earliest characteristics of the Renaissance. Le Miroir de Musique presents a large selection of French and Italian chansons which enriches our view of the cultural sophistication of the Italian courts at the start of the 15th century. From Early Music review: The brothers (or possibly cousins) de Lantins were born in Liège and sought their fortune in Northern Italy. Their close career connections with each other and with Dufay, a fact confirmed by recent scholarship, suggests that the three were close acquaintances socially and musically. In fact, Arnold and Hugo’s music is a distinctive blend of advanced and archaic features, anticipating the music of the later 15th century, but occasionally recalling that of the ars subtilior of the end of the 14th. The present selection of settings by both men of French, Italian and Latin texts is beautifully presented by the singers and instrumentalists of Le Miroir de Musique. They are absolutely at home with this repertoire, and their intelligent and highly musical readings are augmented by a genuine passion for the music. In fact, notwithstanding the title of the CD, three of the works are sacred works, the different musical texture also marking them out from the secular repertoire. The instrumental accompaniment to the voices revolves around a pair of vielles with lute, guittern, recorder and hurdy-gurdy although in a couple of the instrumental pieces the band branches out very effectively on to bagpipes, shawm, slide trumpet and pommer. These are lovely subtle but authoritative performances of little-known repertoire highlighting the strengths of contemporaries of Dufay and augmenting our knowledge of a fascinating period of musical flux.